Before you start picking up furniture for the space, it is important that you plan it out first. To do this, you need to understand the kind of space you have at hand, your budget and frequency of people to that area. For instance, if you have kids or would be inviting guest from time to time, it is a good idea to for light weighted rustic pieces that could handle the wear. Additionally, it is a good idea to go for items that are light-weighed such that they could be moved around easily. When it comes to placing them, take care that they are not blocking the entryways and exits and there is enough space to walk around the area. If you have a small area and you are planning to convert it to a drawing-dining space, then it is advisable to go for less furniture as more number of items will make the space look cluttered. Similarly, using less items in a bigger area will create a distant and cold feeling in the space. 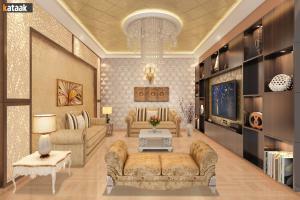 Decorative ceilings are an important segment of home decor and add elegance to a space. 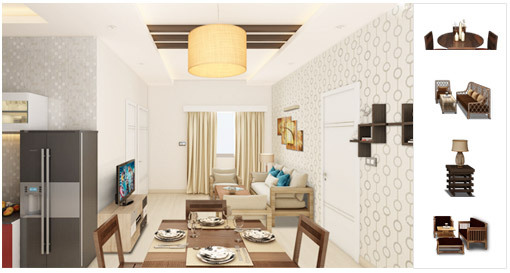 Before choosing one for the drawing- dining room, ensure that you have all measurement details including the dimensions and shape of the ceiling (original) and headroom needed by you. You can measure the headroom by marking the height of the wall you need (calculating it from the floor), leaving the remaining space for the ceiling. You can do this easily with an inch tape. In case, there is a variation in the slope of the floor, use a spirit meter to mark the headroom space. 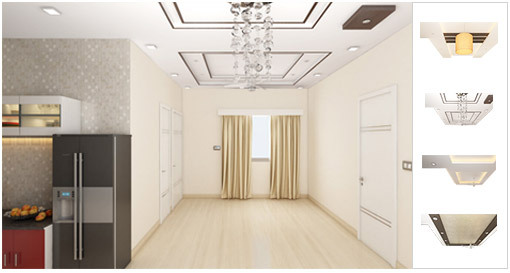 When it comes to the availability of options in false ceilings, limitless is the word. In general, you can choose across POP (Plaster of Paris), wood, gypsum, thermocole, PVC or a combination of all or some of these materials. 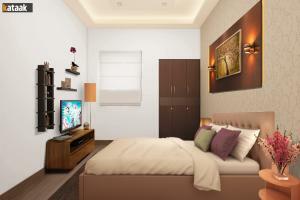 You can install light fixtures or ornamental decor items on the ceilings as well. 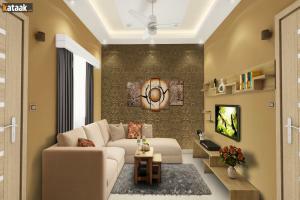 Price of a false ceiling varies from Rs 50 per sq. ft. to over Rs 500 per sq. ft., depending upon the material, brand and size of the space. Treat the walls of your drawing-dining room as an empty canvas and design it according to the preference, theme and requirement. 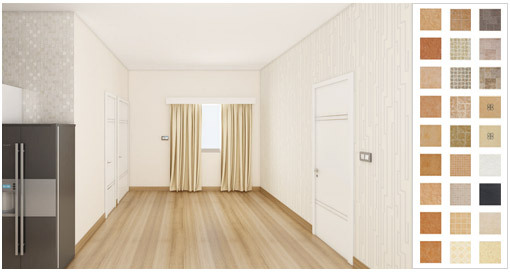 Broadly, we can classify the wall decor portion into two parts, wall paint/wallpaper and decor. 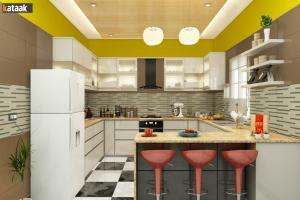 Choose bright and lively colors for the drawing-dining room, so that creates an atmosphere of intimacy and engagement. If only have a small hall way and plan to convert it into dining space, then don't go for dark shades like red, bottle green, navy blue etc as they make the space look even tinier. 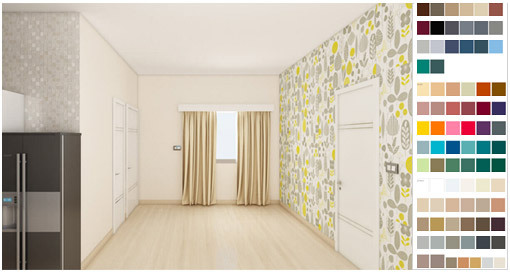 Same concept is applied, if you are planning to add wallpapers to wall to create a statement room. With wall decor, you have endless options. From putting up paintings to wall art, hanging family portraits to little shelves with creative knick-knacks, there is so much to do. However, while choosing an artwork, ensure that it blends well with the theme of the room and does not make the space look cluttered. It is advisable to go minimalist and use only statement art pieces. Flooring to be used, depends upon the location and area of the space. If the drawing-dining area is hooks-off to the kitchen, go for highly durable flooring like tiles or stone, which is stain, scratch, moisture and heat resistant. If the dining room is adjacent to the living room, pick any flooring blending with the overall theme of the space. Happy Drawing + Dining Room Decorating to you ! Whether you are hosting a party for friends or coming together for regular meals, drawing-dining space is the place for discussions and cheer. 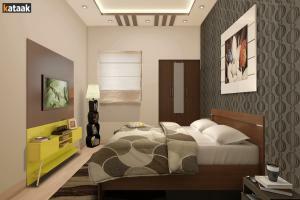 And for such a happening place in your room, you will need stunning decor and planning. 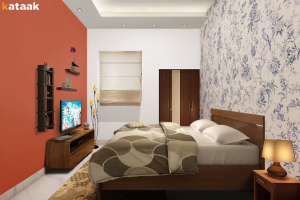 We at Kataak- World's Ist Live Home Designer help you with it and much more. Kataak is an online platform that lets you plan, design and decorate your drawing-dining room online. Yes, from now no expensive and time wasting consultations with designers, as now you can design your room the way you dream it to be online easily. 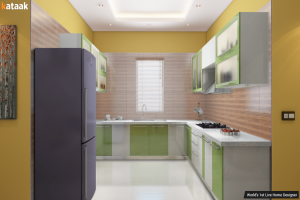 Choose your drawing-dining room size, look through drawing room interior design inspirations and play with endless options in categories like wall paint, furniture, furnishings, ceiling, flooring and decor to create the look you wish to have. Keep your expenses within budget with our integrated price meter that displays the approximate price of the design with contributions of individual products. Tweak or restyle the look to your heart's content anytime. Save or share the home interior designs you created across social media or mail with loved ones and take their opinions. The best part- all elements in Kataak online design tool are real. Thus, you know what you see can be implemented in real. 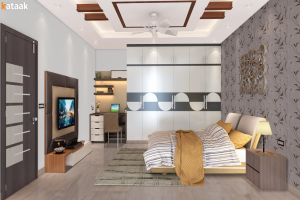 When finalised, Kataak also provides you with an option to get the design executed by connected you with a handpicked team of interior designers. Compare profiles and quotes to get the best home decor job done at the best of the prices. We at are your one stop for drawing-dining room decor. Try the tool today!